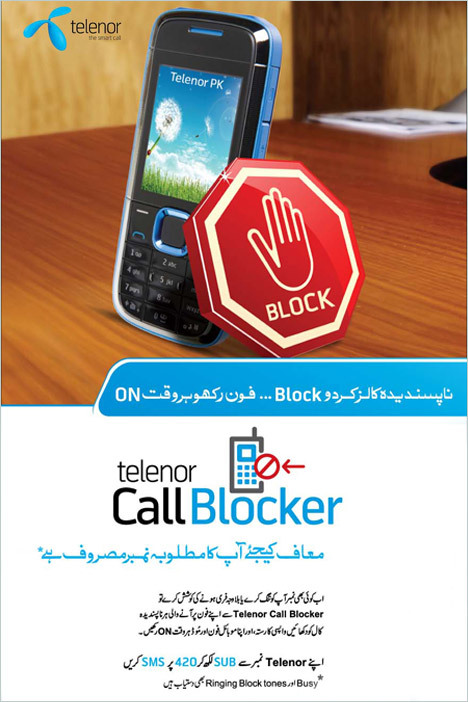 Posted 10 years ago by Aaqil M.
Telenor has also introduced call block service – similar to Ufone’s call block service but I will never use these kind of services when I can block calls and text messages free using my phone’s built in features – or you can install call and SMS blocking software on your handsets. IVR: Rs. 2 + tax per minute. You can block unlimited numbers including PTCL and Mobile but can block only national numbers international callers blocking is not being provided in this service. You can block only calls, cannot block sms with this service. You can choose from four prompts which your blocked caller will hear whenever they will try to call you (It means you can make them fool : -P), Busy tone, Wrong number prompt, phone switched off prompt, phone no reply prompt. These settings can be changed by logging in to http://202.69.15.124:8080/tellin/ics_user_index.jsp by default your blocked callers hear busy tone. Telenor users, to register for this service write sms “sub” without quotations and send it to 420. You can unblock the blocked number by sending U<space><number> to 420, for Example U 03451234567 to 420. You can get the list of blocked numbers by sending ‘BL’ to 420. WOWWWWWWW….. Much awaited Service… Thanks you Telenor… The Smart Call.. I do not like Telenor bohat lootnay wali company hai. How are you saying that? They have one of cheapest tariff. Where is their cheapest tariff dear? Have you seen their djuice SMS rates? They may be expensive in one area, but cheap in another – it depends on what is their intended target market. Djuice ke mehangi calls nay to pichli sub say mehangi company Mobilink ko b pechay chor dia. They said that Incoming SMS won’t be blocked, Only Calls will be bloacked. This wont be of much use. dear frnd can u tel me dat i hav buy blackberry 8230 at 17000 4rm mobilink service center at cash payment but ther is only mobilink sim working and other network (telenor,ufone,zong etc)r nt working plz tel me soultion. Go to Mobile shop for unlocking CODE of your Mobile. Only then you will be able to get the option of PAKISTAN in country list and hence the option of “Mobilink” in the Network box. These are Telenor and Warid who brings the rates to mobilink and Ufone from Sky to Earth otherwise even they are charging for incoming calls.calls 8 rupees+ tax and SMS are about 5 rupees +Tax and no easy load to load less then 500 available. So kis na lota apna subscribers ko? Those were old ages, And Ufone is still cheapest service provider where Mobilink and Telenor are the most expensive service providers of Pakistan. yes, the whole credit goes to telenor . as for sms packages are concerned telenor cost 12 rupees for 2 weeks subscription while ufone 28. thats pretty much difference. -It is NOT a service indeed, rather a demo version of a software which you have to download. 1-Caller alwasy understand it as callee is making the handset “busy” by his own. 2-Message comeinto your mobile and save in a seprate place other than your Inbox. Means sender will receive the sent confirmation if allowed by network. By both means its orignal need has not been full filled, rather just making a bullet that they have this “service” in their network. Another drawback if you don’t use the new version still your money has been deducted automatically. thanks to all of my frndz who really helpd me. by the way ufone also has a limit of numbers you can block if you are a prepaid customer…telenor has none.. unlimited..
none of us would like to work for free ourselves..right.. then why criticize them..
Telnor is not stupid.. to be expensive.. they no what is the demand and where there service is beter than others..
As the sms delivery reports service is withdrawn by Telenor.Due to which We are suffering a lot of problems. I do not think where Masheraykhas of PTA mister lotayri Telenor is also suggestion to other companies to implement charges on Free Balance checking services. SMS dilivery report by technology is also a sms.. basically it is auto generated and requires similar technical capacity. so if all operators who now are benefiting this nation by almost free sms generating millions of sms per minute, takes away dilivery reports, it cleasrs half of there capacity..
now that means, less network congession, and better call quality.. and much less SMS loss..
that is why all major operators (not small with less base) giving daily bundles.. took away daily reports.. Yes, by disabling features and services to provide better services to customers only Telenor thinks like this only to save own pockets, where others were keeping delivery reports and free balance check services until in the “The unity group of telenor with PK cellular networks” telenor suggested all other networks to disable delivery reports and free balance check *to provide better services to customers*. bera garak tera chalak telenor. @ Corporate Wars….Buddy I really appreciate your understanding on telco…kep up the good work…. Delivery reports can reduce the revenue of sms. But has nothing to do with quality of calls at all, because it uses seprate channels. and other wasy are also those never hurt the voice due to QOS. Actually, SMS and calls use the same channel. Have you noticed how sending and receiving texts become awfully slow when you’re in a call? wid dis service i can block calls buh wat about msgs? how do i unsubscribe from this service? kindly lemme know if anybody has a clue about it… thank you! its very bad 20rps per month tell me the way to dis activate this expensive call block service on telenor ..?? uuggghh this stupid thing subscribed itself and it wont unsub!!!! help me i barely have balance !!!! yar men ye musibat unsubscribe kese hogi.